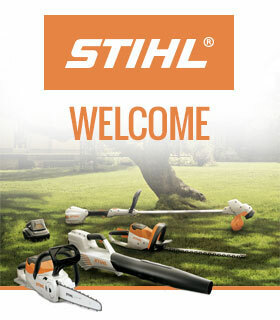 STIHL’s new 4 Series petrol lawn mowers are packed full of practical features to make mowing your lawn easier. This range has been designed to help you get the job done no matter the challenge ahead, and there are five mowers to choose from. 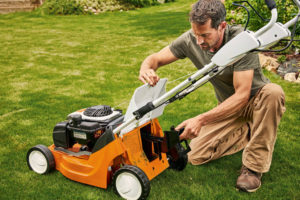 The first lawn mower in this range is the RM 443 T. This lawn mower is ideal for medium to large gardens and is equipped with the effort-saving 1-speed drive, which propels the machine up those steeper, more challenging lawns. 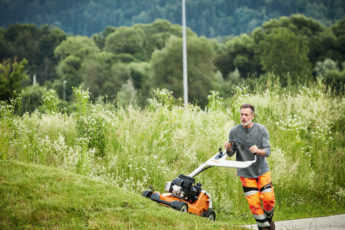 It has a 41 cm cutting width and can mow up to 1200m2. Comfort is key when you have a large area of grass to cut, and this is where the RM 443 T’s features really come in handy. The super soft grip on the handlebars and the easy running wheels make using this machine over a longer period of time much easier. Even the polymer grass catcher box is simple to open and empty, thanks to its clam shell design – just unclip it and empty it all straight out into a garden waste bin or compost heap! The 4 Series range also includes the RM 448 T, RM 448 TC and RM 448 VC. 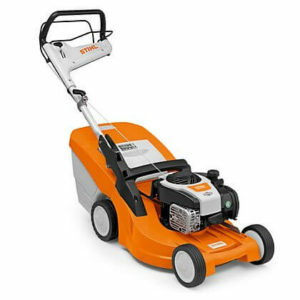 Although there are similarities between the models (they all have a 46 cm cutting deck, for example), each of these mowers has been designed to have different benefits to best suit what you need from your lawn mower. The RM 448 T has a Briggs and Stratton 575 Series EX OHV RS engine and one-speed drive to make it much easier to move around the lawn. The RM 448 TC also has one-speed drive, but this model features our unique mono-comfort handlebar too. It’s an extremely sturdy handlebar, which can be easily adjusted to suit your height, as well as giving you easy access to the grass catcher box. Storing the mower is more compact as well, as the handlebar can easily be folded over in one quick movement for storing and transporting. 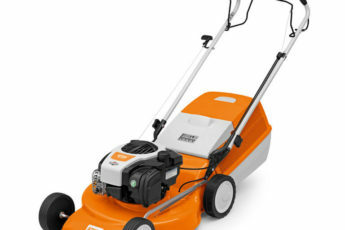 If you need a mower with a bit more flexibility, then you can also consider the RM 448 VC. This model has Vario Drive, which means you can vary the speed as you mow the lawn using the lever on the handlebar. This is ideal if you have a different range of terrains on the lawn you are cutting. Lightweight but robust, the polymer housing of these mowers make them lightweight and manoeuvrable, whilst the Ready Start engines mean they are all easy to start with very little effort. 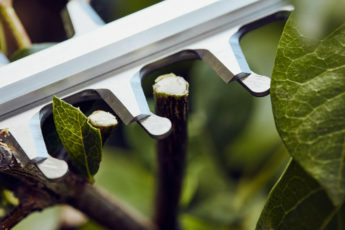 All of these mowers also have a central cutting height adjustment so you can adjust the height using one simple-to-operate lever. The final mower in the 4 Series is the RM 4 RT, a domestic mulching mower with one-speed, front wheel drive. It mulches the lawn as you cut, which means that the grass is shredded finely before being dropped onto the ground to naturally fertilise the grass. It’s a great free way to a healthier lawn! You can also fit mulching kits to the other 4 Series mowers too though, if you do want the best of both worlds! 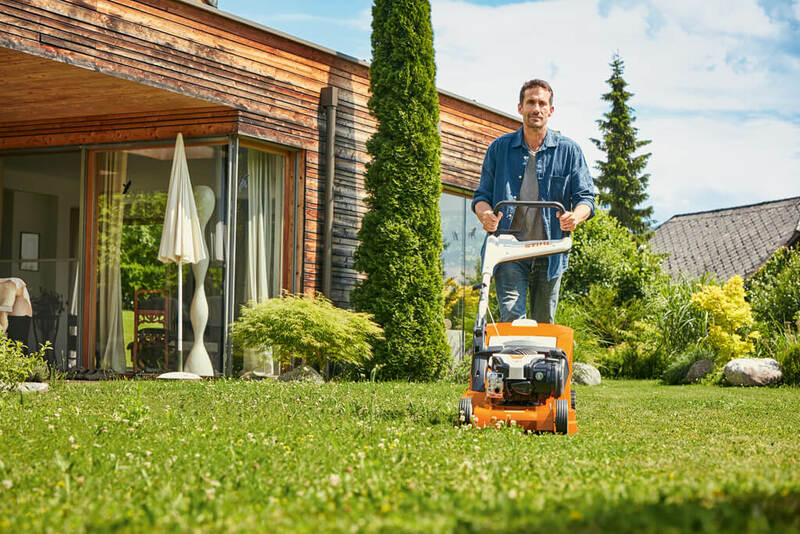 All STIHL 4 Series lawn mowers come with a five year warranty for domestic use so you can be confident that you are choosing a mower you can rely on. To get the best out of your mower, why not consider our ethanol-free fuel, Moto4Plus, which has been specially designed for small 4-stroke engines. With almost no olefins or aromatic compounds, it means the air you breathe is much cleaner and it’s better for your engine too. It’s a win-win situation!